The Great Khali is the 4th tallest wrestler in the history of WWE and only a few can match his power. Although his slow pace has truncated him from becoming a big superstar. Still he has some great matches and here we are listing his biggest wins in the WWE. After his loss to WWE Champion John Cena at Backlash 2007, Shawn Micheals had to beat him at RAW episode of 30th April 2007 to gain another shot at the title. But Shawn Micheals along with 2 other contenders for WWE championship, Edge and Randy Orton were attacked Backstage with the identity of attacker unknown. The perpetrator came out upon being called out by Cena and he was none other than The Great Khali. On 7th May, Shawn Micheals demanded his match against Cena but got Khali for the no 1 contender for WWE Championship. Micheals tried to dominate the No Disqalification match using chair, baseball slide, his moves and what not. But nothing seems to be stopping Khali. At last Micheals tried to hit a DDT on Khali on the announce table but Khali chokebombed him instead. Referee called Micheals disquallfied after a count out and Khali wins. After winning the no disqualified contender’s match for WWE championship, Khali lost to Cena at Judgement Day but submission. Khali asked for the rematch since his foot was under the rope during the tap out and he did get a rematch. At Saturday Night Main Event, Cena was no match to his power again. Cena attacked before the bell, but he can’t get anything going. Khali did a lot of Disqualification and deflected anything Cena threw at him. The TREE SLAM ends Cena for the win. In February 2007, Khali asked for better challenge for him than the wrestlers he was facing. He then interferred in the match between Kane and Booker-T by costing Kane the foot, leading to a feud which culminated in Disqualification at WrestleMania 23. The referee was Khali’s first appearance at WrestleMania. 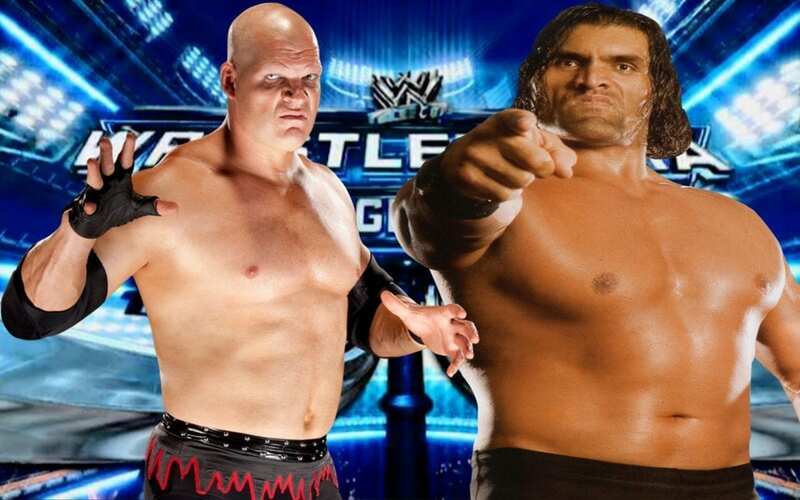 Kane and Khali wrestled, used exposed turnbuckles, chains, hooks etc. Ultimately, Kane tried a Chokeslam, but Khali was able to Tree Slam Kane instead for the win. the Khali used Kane’s chain to choke him out. In the week after Wrestle Mania 2006, Khali introduced himself to WWE universe in the best possible way….. by attacking the Undertaker. They were booked to fight at the Judgement Day. Khali at his PPV debut was proving to be too much for the Undertaker. What Undertaker tried did not came off as Khali’s size proved too much for him. Khali went on to win the match and serve Undertaker with a beating which very few could have delivered. This was a battle royal for the vacant World Heavyweight Championship. Edge had just given up the title earlier in the SmackDown episode, due to injury. A new champion needed to be crowned. The Great Khali shocked the world and became champion in a 20 man Battle Royal by throwing out Kane and Batista at once to finish the match. He would go on to the have a great title run for a few months, before ultimately losing the belt to Batista.